Despite being belted many occupants in rollovers and accidents are ejected from the vehicle or these occupants are severely injured or killed in the secondary impacts inside the vehicle, all caused by a defective seat belt, buckle or retractor. Without having a functioning seat belt or airbag in an accident, the occupant is helpless and vulnerable to severe injuries. Most police officers will cite and ticket any occupant as unbelted if that person was found outside the vehicle even in the light of obvious seat belt usage. Studies show most occupants are safer inside the vehicle in a rollover coupled to their seat with the seat belt holding them in place and allowing proper safe placement of their head and torso, than outside the vehicle. Some defective seatbelts will release due to manufacturing defects and others will not hold and release due to design defects. In some cases the actuator button is too big or raised and inadvertent contact with a hand or elbow causes the seat belt buckle to open during a wreck or rollover. Other seat belts can be hit by the pelvis or an object and inertially open due to a design defect with the spring and in other cases the shoulder belt retractors are defective and do not hold or lock and skips allowing excessive slack to be introduced into the belt, allowing too much movement of the occupant. When this happens, the occupant may ejected or may impact the roof, header, roof pillar, dash or even the oncoming vehicle or object. 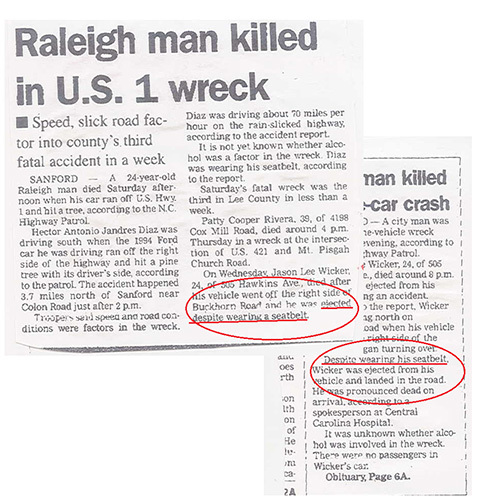 Anytime there has been a major accident or rollover related injury or death and it is questioned whether or not the belt was used, one needs to properly inspect the belt to see if the belt housing or buckle are broken, if excessive slack is still seen not rolled up or retracted or whether seat belt webbing tears or load marks can be observed. Often a seat belt expert is needed to inspect the belt, the retractor, the buckle, latch plate and the webbing. NOTE: The client must not try and take the belt system or housing apart as it can harm the case and later a Judge may even dismiss the case due to tampering or spoiling of the evidence. In many cases our law firm has been able to prove that seat belts were in fact used, but failed to hold as designed. In many of those cases, the clients would have walked away from the accident, but sadly now are totally paralyzed !! In one case such it was the seat belt bruises 6 weeks after the accident across this young woman’s hips proved lap belt use. In another notable case our client’s first words to the EMS was “I don’t understand how this could have happened, I was belted.” In both cases the clients were rendered quadriplegics due to the seat belt failure to hold them in place.